The 107 is a rugged, accurate probe that measures temperature of air, soil, or water from -35° to +50°C. It easily interfaces with most Campbell Scientific dataloggers and can be used in a variety of applications. The 107 consists of a thermistor encapsulated in an epoxy-filled aluminum housing. The housing protects the thermistor, allowing you to bury the probe in soil or submerge it in water. 305 m (1000 ft) is typical and requires no programming changes. When exposed to sunlight, the 107 should be housed in a 41303-5A, 41303-5B, or RAD06 6-plate radiation shield. The louvered construction of these radiation shields allows air to pass freely through the shield, thereby keeping the sensor at or near ambient temperature. The shields’ white color reflects solar radiation. The 41303-5A and RAD06 attach to a crossarm, mast, or usersupplied pipe with a 2.5 to 5.3 cm (1.0 in to 2.1 in.) outer diameter. The 41303-5B attaches to a CM500-series pole or a user-supplied pole with a 5.1 cm (2.4 in.) outer diameter. The 107 is suitable for shallow burial only. 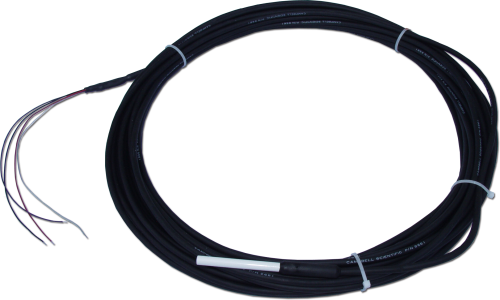 Placement of the sensor’s cable inside a rugged conduit may be advisable for long cable runs—especially in locations subject to digging, mowing, traffic, use of power tools, or lightning strikes. The sensor can be submerged to 15 m (50 ft) or 21 psi. Please note that the 107 is not weighted. Therefore, the installer should either add a weighting system or secure the sensor to a fixed, submerged object, such as a piling. What are the part numbers to order replacement dowels for measuring fuel temperature and moisture? The CS506-L Fuel Moisture Sensor uses a 26601 10-Hour Fuel Moisture Stick. The 107-L Temperature Probe uses a CS205 10-Hour Fuel Temperature Stick. Both of these dowels can be easily replaced in the field with a Phillips screwdriver and an adjustable wrench. Where is there a picture with part numbers for the fuel moisture sensor, fuel temperature stick, temperature probe, and mounting stake? For descriptions and illustrations (with part numbers) of the various instruments used in measuring fuel temperature and moisture, see the "Remote Measurements" brochure. How often should the fuel temperature and moisture dowels be replaced? Both the 26601 10-Hour Fuel Moisture Stick (used with the CS506-L) and the CS205 10-Hour Fuel Temperature Stick (used with the 107-L) can be easily replaced in the field with a Phillips screwdriver and an adjustable wrench. The dowels should be replaced each spring; more frequent replacements may be required in some environments. The more wet/dry cycles the dowels experience, the more frequently they will need to be replaced. The 107-L/LC, 108-L/LC, 109-L, 110PV-L, and BlackGlobe-L temperature sensors can be calibrated. How can measurements be made using a 107, 108, or 109 temperature sensor/probe with a measurement device other than a Campbell Scientific datalogger? To measure the sensor/probe, the measurement device has to provide a precision excitation voltage (Campbell Scientific dataloggers use 2000 mV), measure the voltage across the precision resistor, determine the thermistor resistance (Ohm's law), and convert the resistance to temperature using the Steinhart-Hart equation.